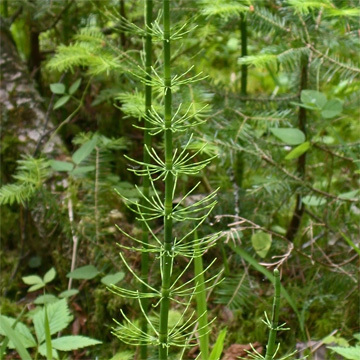 Water Horsetail (Equisetum fluviatile) | Plants of the Northeastern U.S. Ditches, shores, marshes, and bogs. In mud or shallow water. Circumboreal; occurring as far south as southern PA, IL, IA, NE, and WA in North America. Fertile and sterile stems alike, produced annually, to 1 m or more, with 9-25 smooth, shallow ridges; central cavity more than half the diameter of the stem; sheaths green, 4-9 mm, with black or nearly black, persistent teeth 1.5-3 mm or more long; branches may be lacking or abundant from the middle and upper nodes. Strobilis 1-2 cm, pedunculate, deciduous. Another common name is simply "Pipes".